Planning a menu, talking about food, thinking about food, reading about food, making food… Many of my days are consumed with these delightful tasks. I post Instagram photos of a desk cluttered with books and papers, in case anyone else is as enamored as I am with the books and magazines I’m reading, the menus I’m planning, the recipes I’m inventing. 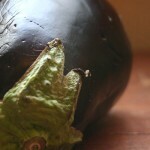 I posted a few weeks ago about “The Art that is Life“, “Today I noticed the cracks in the eggplant that I’d photographed, that remind me of smile lines on the face of someone who has smiled a hundred thousand times. I saw the light that streams through the window in my office. My office is in what’s meant to be the dining area of our apartment. But space is limited, so one thing becomes another. And the kitchen is slowly taking over everything. I was inspired, as I often am, by something that I’d been reading. A book called The School of Essential Ingredients‚ is a novel that Tim picked up for me at a used book sale a couple of months ago. The way that Erica, the author, describes things resonates so perfectly in my brain. It makes me want to shout! She puts things into words that I would have never known needed desperately to be described. It is a beautiful book and a lovely story. I can’t wait to read it again and again. Another form of inspiration often comes from The Flavor Bible. Karen and Andrew’s book is my go-to for figuring out what I want to add to or subtract from a recipe. 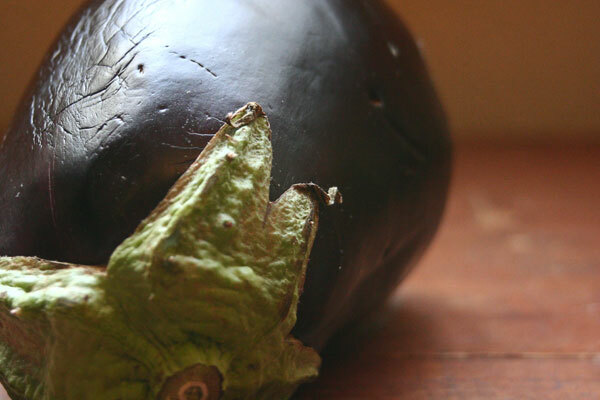 Often, I find myself standing in front of the fridge or pantry cupboard with the door open, just staring at the contents, and then all-of-a-sudden I’ll see something, a bell pepper, a bag of rice, some leftover chicken, and an idea will pop into my head. I’ll rush to my desk to grab a piece of paper and The Flavor Bible and quickly write it down. 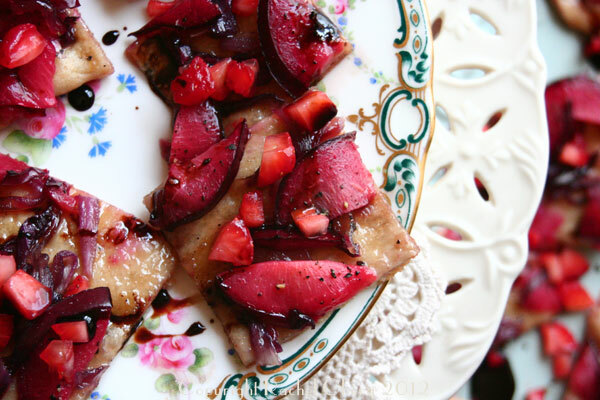 I often end up with things that I might not have otherwise thought to pair… Black pepper and pluots, for example. I use it most days. It’s one of my most loved kitchen tools. This giveaway is now closed. Thank you to all who entered! The winner is Jenn Swedlund!! Congratulations, Jenn! Please email me at demacuisine@racheloberg.com with your mailing address so we can send you your prizes! I hope you enjoy these lovely books!! Leave a comment on this post (why you’d like to win, just saying hi, if you’ve ever read these books before… a little note). 1. “Like” De Ma Cuisine on Facebook and leave a separate comment letting me know. 2. “Like” Karen and Andrew’s page on Facebook and leave a separate comment letting me know. 3. “Like” Erica Bauermeister on Facebook and leave a separate comment letting me know. Giveaway is open to residents of North America. Winner will be notified by email or via Facebook and will have 3 days to respond with a mailing address. Thank you to the authors of both books, Erica Bauermeister, and Karen Page and Andrew Dornenburg, who have generously donated a copy of their books! Giiiirl – you know I make it a daily habit to see what’s going on in your kitchen….often pining that your kitchen lived in my kitchen. Give a big ole smooch to your fur-baby for me (as I miss him dearly)! I’ve been following Rachel and subscribing to AHO for about a year and a half now. I think since she started!! Your recipes have been so convenient and helpful trying to use what we get every week! I’ve liked De Ma Cuisine’s page for a long time, Karen and Andrew’s for a while and just liked Erica’s page on FB. 🙂 My cousin is a chef in NYC & Brooklyn and she would be proud of me for winning either of these books! She’s also a fan of the Flavor Bible. Thanks for another giveaway, Rachel!! I love Erica’s book The School of Essential Ingredients. It would be great to win a copy to give to a friend. 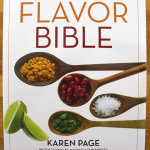 The Flavor Bible sounds like a good book, I think it would be fun to experiment with new flavor combinations in my cooking. Thanks for the giveaway! 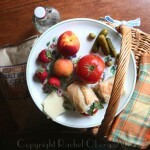 I just liked De Ma Cuisine on Facebook. I just liked Karen and Andrew’s page on Facebook. I already have a copy of The School of Essential Ingredients, so if I won, I would pass it along to someone who would also appreciate it! I already like Erica Bauermeister on Facebook. I already “like” Erica Bauermeister’s Facebook page, which is how I found out about this giveaway. The School of Essential Ingredients is on the list of books that belong on my bookshelves… and I’ve never read the Flavor Bible, but I’d love to! i am very interested in cooking. your post has so much interesting cooking recipes. and very easy to follow. i have recommended to my friends to like your post. and one thing that catched my attention is your profile name “De MA Cuisine”….is MA a family name. as you see, i am former Miss ELENA MA! Interesting……..
Elena! Thank you for your sweet compliments! De Ma Cuisine is actually French for “From My Kitchen”. 🙂 I grew up in Canada and learned to speak French in school. I also love Paris (although I have never been)… so I combined my love for cooking with my love for French. I love Rachel’s blog and receive such inspiration from it. 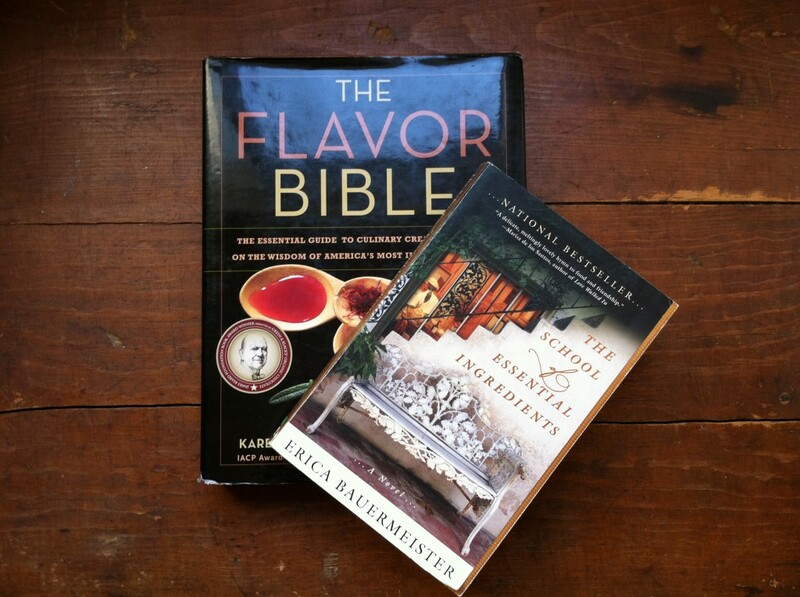 I have not read either the The Flavor Bible or The School of Essential Ingredients. 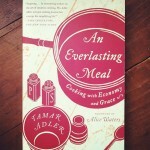 I am looking to increase my cooking abilities in my retirement so I would love to win one of these books! I am confident what ever De Ma Cuisine recommends will be fantastic! Just the pictures alone! I am really intrigued by theses books which seem to be about concepts more than just a collection of recipes and would love to win one! I would love to have a copy of these books. I am gradually getting into vegetarian cooking which helps with my weight lose tremendously. Making a brand new recipe or with ingredients that I have not tried before is like having a religious experience. The different flavors are divine. My roommates say I make restaurant quality food. YAYAYAYAYAYAYAYA! It’s my birthday this Friday, and this is a perfect present for me! Thank you!